Japan’s involvement in the World War II began on December 7 1941, when it attacked the American base in Hawaii, Pearl Harbor. On the same day, Japanese airplanes raided airports in the Philippines, and two days later, the Imperial Army landed in the country and started its carnage. After a few turbulent months of fighting, and significant defeat in trying to take over Leyte Island, Japan was forced to leave the war zone. This particular event was well detailed in Nobi, a novel written by Shohei Ooka in 1951 and was later made into a film, Fires in the Plain, by Kon Ichikawa. In 1959, it was dismissed by various American critics, stating that Ichikawa’s adaptation of the book was “a gratuitously bleak anti-war movie.” 56 years later, Shinya Tsukamoto, a prominent Japanese filmmaker, decided to do the remake of the film of the same name. Fires on the Plain revolves around Private Tamura, who tries to retreat from the Philippines in the final weeks of World War II. The film opens with Tamura having a conversation with his squad leader. He is told that Japanese are dying “slow and painful deaths”, and, with him having Tuberculosis, he would only be a burden on his fellow soldiers. He is ordered to go to hospital, which looks more like a butcher’s house than a medical facility, to seek treatment for his TB. After two unsuccessful visits, he returns to the camp, where he is told that if the hospital is not willing to take him, he is to use his hand granade to blow himself up. He doesn’t get a chance to go to hospital again, as the camp and sourranding area is bombed by the Americans. Despite this, he manages to run away and start making his way out of the island. He gives up his food rations, only to be able to join a small group of soldiers, in hope of reaching Palompon from where he would be evacuated to Cebu. Tamura meets Nagamatsu and Yasuda, men who, later in the film, make a huge impact on his wellbeing. Throughout his journey, Private Tamura battles “starvation, fatigue and delirium”. While wandering, he encounters different people along the way, many of whom are dead, and he is sometimes surprised to find corpses that are still clinging to life. In what critics call a vivid hell, Tamura strongly holds on to his humanity, and embraces hunger and thirst. While others, with great brutality, start to kill locals for meat. He is tempted by cannibalism himself, and seeing body parts everywhere he goes doesn’t make it easier for him to survive on what nature has to offer. How far do humans have to push themselves to make it through such a horrendous ordeal? Is there a way to stay alive without loosing their humanity? The conversations in the film were short yet there was richness in it, and I do appreciate movies with limited dialogue. However, the gratuitous scenes, which showed countless body parts, rotten corps and injured soldiers were revolting at times. Shinya Tsukamoto’s portrayal of Tamura also felt flat. Somehow I was not able to connect with his character. It was more about him showing his disbelief in what was happening around him rather than showing his deep emotional state of mind. He definitely didn’t give his best performance in Fires on the Plain. The film itself was positively received by international film critics and was selected to compete for the Golden Lion at the 71st Venice International Film Festival. RAINDANCE: Lets talk about the origin of the film. First, there was a novel written by Ooki and the 1959 film by Kon Ichikawa, where did you first experience the story, was it the book or the film? 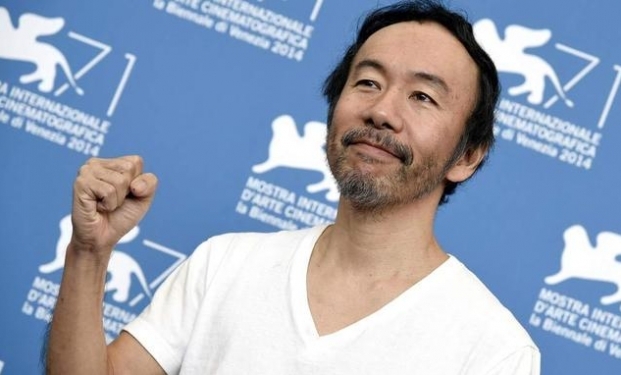 Shinya Tsukamoto: I really respect Kon Ichikawa and I did like the film, but in terms of what makes me think of the film was the original source, which was the novel by Ooki. I read the book when I was in high school, which was long time ago. I was fascinated by the contrast between the beauty of the nature and muddy human conditions. I really wanted to show that in my film. Kon Ichikawa’s film concentrated more on the human side, but in my case, I wanted two show both, the beauty of mother nature and the struggle of the human being. VOTA: The film itself was emontionally draining and sickening at times. Was this what you wanted to achieve by making this film? Shinya Tsukamoto: It was my intention to show the savagery of war and to remind people that war carries death, unimaginable suffering and that there are always consequences of it, such as mental illness or psychological issues. VOTA: I am not sure if making Fires on the Plain will make any difference in how people perceive war, why did you push yourself to do this project? Shinya Tsukamoto: I felt a sense of crisis and urgency that I have to make this film now. While making it, I really wanted to show that I strongly disagree with the Japanese government, which recently approved a reinterpretation which gave more powers to its Self-Defence forces, allowing the Army to go abroad and defend other allies in case of war being declared upon them. I wish I made this film before this act came into power. However, due to lack of finances I wasn’t able to make it earlier. Now that the constitution has been changed, the only solution is to protest against it and show the government that we disagree with its decision. Also Japan is a very peaceful nation nowadays, and they started to forget about the atrocity of the war. That’s why I decide to make Fires on the Plain. RAINDANCE: Those films of yours that I know, and I can’t pretend that I have seen them all, do have fantastic elements, something supernatural or being the real. This is the first film, that I know of, which is 100% in the real world. Did you feel that it was what you wanted to do or do you feel it is a continuity through the other world. Shinya Tsukamoto: It was probably a natural progression. I fantasise a lot in my head about what you could see in my previous films. When I made them Japan was a very peaceful place to live in. Nowadays, people in Japan do not know the atrocity of the war, they think that war is not as horrible as everyone else thinks it is. That’s why I had to make this film realistic, it had to be a wake up call for Japanese people. VOTA: Looking back at your films, I realised there is a lot of violence in it. Have you ever thought of writing a subtle story, at least once? Shinya Tsukamoto: (laughs) I have subtle stories in mind sometimes. I feel like I would like to make an opposite movie to what I have done already. I do not make films often, it takes a while for me to make one, and when I make one I want to direct a film that I would like to see myself. Maybe that’s the reason why my films have extensive violence in it. VOTA: One of the most famous Asian filmmakers, Kim Ki- duk once said that he makes violent films because he has no other way to express his frustration and anger towards the world. Is it the same in your case? Shinya Tsukamoto: Definitely my anger and frustration, not necessarily towards the world, can be seen in the latest film. I really wanted to express my irritation with regards to war. However, the rest of my films are slightly different and I would not compare it to Fires on the Plain. It was a great pleasure chatting to Shinya Tsukamoto.